Murphy translation, with original notes at Gutenberg. बुल्गारियाई: Translation at archive.org . 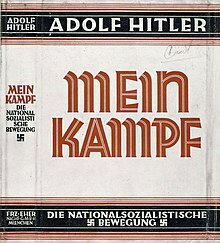 डच: Mein Kampf-Nederlandstalige Bewerking at archive.org . इतालवी: La Mia Battaglia (Second Volume only) at archive.org. पोलीश: Moja Walka at archive.org. पुर्तगाली: Minha Luta at archive.org . स्पेनी: Mi Lucha Abridged Spanish translation. ↑ रॉबर्ट जी.एल. वाएट (1977). The Psychopathic God: Adolf Hitler. बेसिक बुक्स. पृ॰ 237–243. ↑ हीन्ज़, हीन्ज़ (1934). Germany's Hitler. हर्स्ट और ब्लैकेट. पृ॰ 191. ↑ पाएन, रॉबर्ट (1973). The Life and Death of Adolf Hitler. पॉपुलर लाइब्रेरी. पृ॰ 203. ↑ रिचर्ड कोहेन. "Guess Who's on the Backlist". द न्यू यॉर्क टाइम्स. 28 June 1998. Retrieved on 24 April 2008.